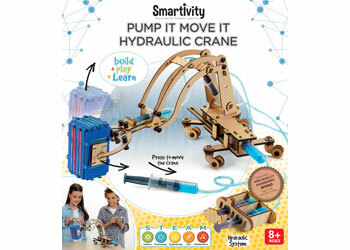 This kit contains all the elements required to build a fully functional hydraulic crane and a mock load that children can lift and move around using the arms of the crane. 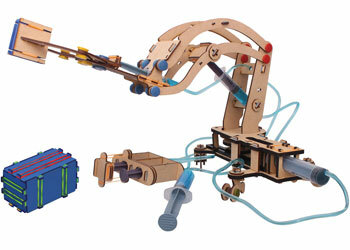 With this kit, children can build their own hydraulic crane. Once assembled, a child can use the hydraulic pressure from the syringes to open and shut the claw of the crane to hold the load, move the arm upwards and downwards, as well as move the arm sideways to carry the load. Children can use things around them and try moving them using the crane, and learn how hydraulic powered machines like cranes, heavy-duty earth-movers, etc work. Pressure: What is Pressure, How can water pressure be used to move objects around.